If you're a fan of Gates ribs and brisket, try this Gates BBQ sauce recipe and see if you don't think it's a pretty good homemade version of the popular Kansas City sauce. To me, it tastes pretty close to the real thing. Gates Bar-B-Q has been around since 1946, with the first store located at 19th and Vine in Kansas City, Missouri. With KC being located in the center of the nation, the city is convenient spot for conventions, one of the reasons Gates has gained popularity with people from all over the United States. This recipe was shared with viewers of the Martha Stewart show by none other than Mr. Gates himself. It's probably not an exact duplication of the commercially produced sauce, but it comes pretty darned close. That's the recipe provided by Mr. Gates, but I do things a little different. To bring out the flavor of the spices, and to get all that sugar and salt completely dissolved I next pour the sauce into a large pan, and bring it to a simmer over medium heat. At that point, I lower the heat and continue simmering the homemade Gates barbecue sauce for 5 minutes, at which point it's taken off the heat, covered, and cooled until it can be funneled into 5 or 6 cleaned, empty bbq sauce bottles. I like the Gates Extra Hot barbecue sauce too, and found that by adding an extra teaspoon of ground red pepper, plus a tablespoon of ground black pepper to the recipe, I get a sauce that is nice and spicy, while still having that great Gates taste. You might feel that 2-1/2 quarts of barbecue sauce is too much to make at one time, so the following homemade sauce recipe will make about one bottle's worth. 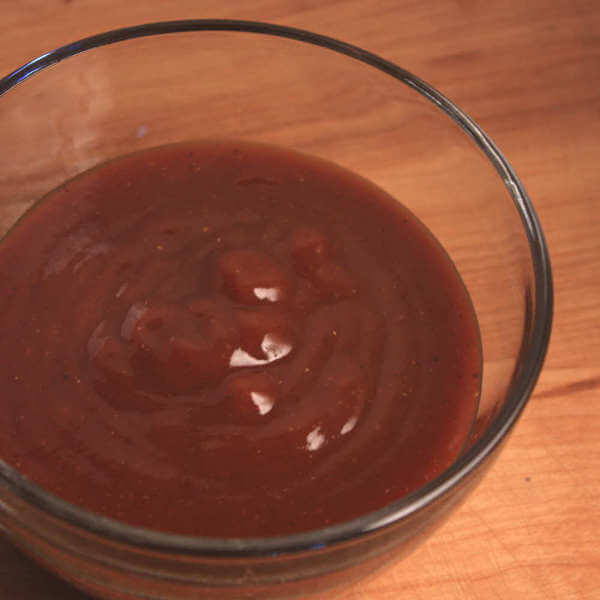 Give this Gates bbq sauce recipe a try, and if it doesn't quite suit your tastes, make an adjustment here or there to create a sauce that pleases you. Make it a little sweeter, or less salty, smokier, or even hotter than fire. There's no law saying you have to follow recipes to the T. And anyway, playing around with recipes is half the fun of cooking!